A judge in the US has ruled that lawyers representing Amazonian villagers used bribes to secure compensation worth billions of dollars from oil company Chevron in Ecuador. The latest ruling means that the Amazonian villagers cannot use US courts to enforce the ruling against the American oil company. In 2011, an Ecuadorean judge ordered Chevron to pay $18.2bn (£11.4bn) for "extensively polluting" the Lago Agrio region. Ecuador's highest court last year upheld the verdict against Chevron, but reduced the amount of compensation to $9.5bn. The American oil firm has always maintained that it cleaned up the area before handing over the oil field to the Ecuadorean government. It argued that it only lost the case because the legal team representing the villagers paid nearly $300,000 in bribes in Ecuador. US district judge Lewis Kaplan in New York has now ruled that Steven Donziger's legal team used "corrupt means" to win the 2011 case. Image caption Chevron's CEO John Watson described the latest ruling as a "resounding victory"
Mr Kaplan described the evidence against Mr Donziger's team as "voluminous". "Justice is not served by inflicting injustice," he wrote in the ruling. "The ends do not justify the means. There is no 'Robin Hood' defence to illegal and wrongful conduct." Chevron's chief executive, John Watson, hailed the ruling as "a resounding victory for Chevron and its shareholders". 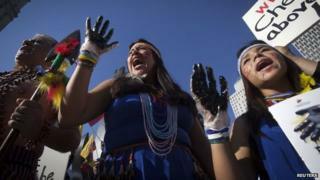 The legal team representing the Ecuadorean villagers have also sued Chevron in Brazil, Argentina and Canada.